Michelle A. Williams, a distinguished epidemiologist and educator, will become the next dean of the Harvard T.H. Chan School of Public Health. Michelle A. Williams, S.M. ’88, Sc.D. ’91, a distinguished epidemiologist and award-winning educator known for her influential studies of maternal and child health around the world, will become the next dean of the Harvard T.H. Chan School of Public Health, starting in July. Since 2011, Williams has been the Stephen B. Kay Family Professor of Public Health and chair of the Epidemiology Department at the Harvard Chan School. The principal investigator on several international research projects and training grants funded by the National Institutes of Health, and co-author of more than 400 published research papers, Williams is also the faculty director of the Harvard Catalyst’s Population Health Research Program and the Health Disparities Research Program. Her scholarship is especially known for its creative integration of epidemiological, biological, and molecular approaches to a range of public health challenges, and her teaching and mentoring have been recognized with awards from Harvard, the University of Washington, the American Public Health Association, and the White House. 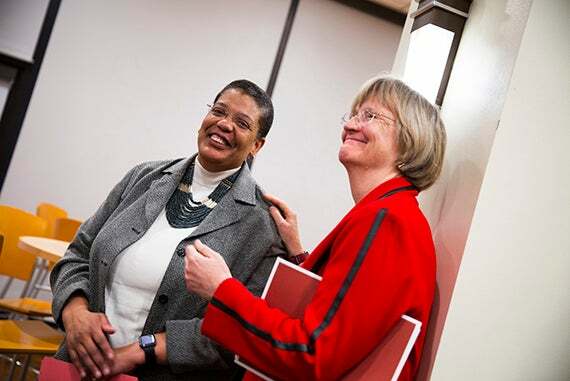 “Michelle Williams is an eminent epidemiologist, an outstanding teacher and mentor, and an energizing leader and institutional citizen, impassioned about the power of public health to change people’s lives for the better,” said Harvard President Drew Faust in announcing the appointment. A 1984 graduate of Princeton University, where she majored in biology, Williams went on to receive an M.S. in civil engineering from Tufts University in 1986. Continuing her studies at the Harvard School of Public Health, she earned her S.M. in population science in 1988 and her Sc.D. in epidemiology in 1991. After a postdoctoral research fellowship at the University of Washington School of Public Health and Community Medicine, she joined the UW faculty as an assistant professor of epidemiology in 1992. Emerging as an internationally recognized epidemiologist and educator, she rose through the UW faculty ranks, becoming an associate professor in 1996 and a full professor of epidemiology in 2000. While at the UW, she was highly active in the Center for Perinatal Studies at the Swedish Medical Center in Seattle, rising to become co-director from 2000 to 2011, with broad responsibility for a multidisciplinary research program involving clinical investigators, basic scientists, and epidemiologists. From 1992 to 2010, she held an appointment as an affiliate investigator at the Fred Hutchinson Cancer Research Center in Seattle, and from 2008 to 2011 she held a joint appointment in global health at the UW. In 2011, Williams was recruited back to Harvard as the Stephen B. Kay Family Professor of Public Health in epidemiology and to become chair of the Epidemiology Department. Her research focuses on integrating genomic sciences and epidemiological research methods to identify risk factors, diagnostic markers, treatments, and prevention targets for disorders that contribute to maternal and infant mortality. Her work is particularly noted for its sophisticated linkages between epidemiology and allied disciplines and for its broad international scope, encompassing studies in Africa, Asia, and South America as well as the United States. As an educator, Williams has led grants, funded by the National Institutes of Health (NIH), that are designed to enhance the education of members of groups underrepresented in the biomedical and quantitative sciences and to train aspiring epidemiologists and other public health investigators in several dozen countries. Last year, she received the Harvard Chan School’s Outstanding Mentor Award, having previously been recognized with the UW’s Brotman Award for excellence in teaching (2007), the American Public Health Association’s Abraham Lilienfeld Award for education in epidemiology (2007), and the White House’s Presidential Award for Excellence in Science, Mathematics, and Engineering Mentoring (2012). As department chair, Williams has guided the Epidemiology Department through a period of notable transition, while contributing to the conception and implementation of a range of School-wide initiatives, including recent major reforms in the doctoral and master’s programs. She remains active with various professional organizations and academic journals, while playing advisory or planning roles for such institutions as the NIH, the Centers for Disease Control and Prevention, the American Diabetes Association, the March of Dimes, and Meharry Medical College. She offered particular thanks to the members of the faculty advisory committee assembled for the search, and to David Hunter, the Vincent L. Gregory Professor in Cancer Prevention and dean for academic affairs at the Harvard Chan School, who has served as acting dean since Frenk’s departure last August to become president of the University of Miami. “My special thanks go to David Hunter, whose leadership, wisdom, and professionalism are so central to the Harvard Chan School’s ambitions and accomplishments,” said Faust. Nearly 25 percent of this year’s applicants had their application fees waived due to financial hardship, a good indication that if they are accepted, they will be eligible for Harvard’s innovative and industry-leading financial aid program.